Defined contribution plans are the most popular way for working Americans to save for retirement. Millions of Americans as well as millions of people from the United Kingdom, Japan, India and other countries participate in the programs designed to allow working citizens to put away money with an accompanying tax relief benefit for use upon retirement. No two investors are identical to each other, but DC participants do follow patterns of investment strategies and household economic decision-making. The demographics of DC participants are on display in Spectrem’s latest report on those investors who wisely choose to put a portion of their paycheck into a defined contribution plan, often with the promise of an employer match of funds. Keep in mind that most DC participants are still in the workplace, which can affect investment decisions they profess to make. The most distinctive trait of DC participants is that they tend to be moderate or conservative risk-takers in investment decisions. The fact they put aside income into a DC plan which often invests in low-risk products shows a tendency toward low-risk decisions. Fifty-four percent of DC participants consider themselves to be moderate risk-takers, and 19 percent call themselves conservative. Only 27 percent consider themselves to be aggressive or most aggressive in risk tolerance. DC participants, who often begin their investment patterns early in their professional careers, more often than not consider themselves knowledgeable about investing and finance. Fifty percent call themselves “fairly knowledgeable” while 6 percent place themselves in the “very knowledgeable” category. 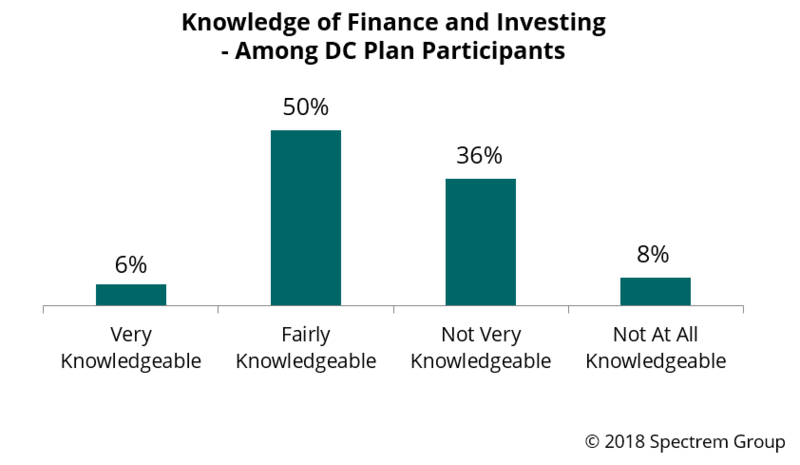 Only 8 percent of DC participants consider themselves “not at all knowledgeable”, an indication that DC participation leads to knowledge about investing. The DC participant market also skews very young, which also makes sense. Forty percent of DC participants are from the Millennial generation, which has now grown to include investors in their late 30s. Baby Boomers, who generally are all at least 55 years of age, make up only 29 percent of the DC participant market these days. DC participants also take their participation seriously, as noted by their DC plan balances as of the spring of 2018. Twenty-five percent of DC participants have at least $100,000 in their DC plans, and 10 percent have at least $350,000. Those amounts obviously parallel the age of the DC participant. Almost 70 percent of DC participants live in a household in which both members work full-time, which is another key to the relationship between investor and advisor. Joint decision-making households tend to be more conservative in investing. The new Spectrem study also examines the social media use of DC participants, their communication habits as they relate to their advisor, and their opinions about the impact of the new tax laws put into effect at the start of 2018. While there are many investors for whom their defined contribution plans are just building blocks to an overall investment strategy for growth, income and security, many investors consider their DC plan to be a key component of their retirement budget. Advisors need to understand the influences which shape investment strategies for DC plan participants in order to serve them as informed and responsive advisors.